The new results were presented at the second Kepler Science Conference at NASA’s Ames Research Center. 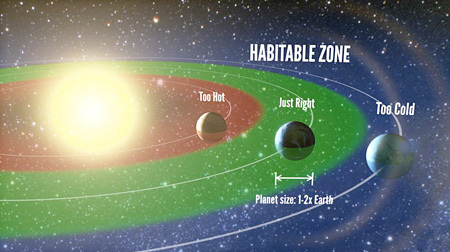 Astronomers have calculated that 22% or about one in five sun-like stars has a planet similar in size to Earth orbiting in the habitable zone, the distance from the star where temperatures could allow liquid water to exist on the surface of such rocky planets. With around 200 billion stars in our galaxy, and about 20% or 40 billion of those being sun-like stars, that means at least 8.8 billion such planets, according to the new research. Some estimates put that number even higher. Wow. Previous studies have also suggested such high numbers, and now the latest Kepler data continues to back that up. Chart showing the numbers of Kepler planetary candidates to date, with increases for each planetary type since the previous update last January. Click image for larger version. Also, 833 new planetary candidates were announced by the Kepler team, of which ten are less than twice the size of Earth and orbit in the habitable zone. 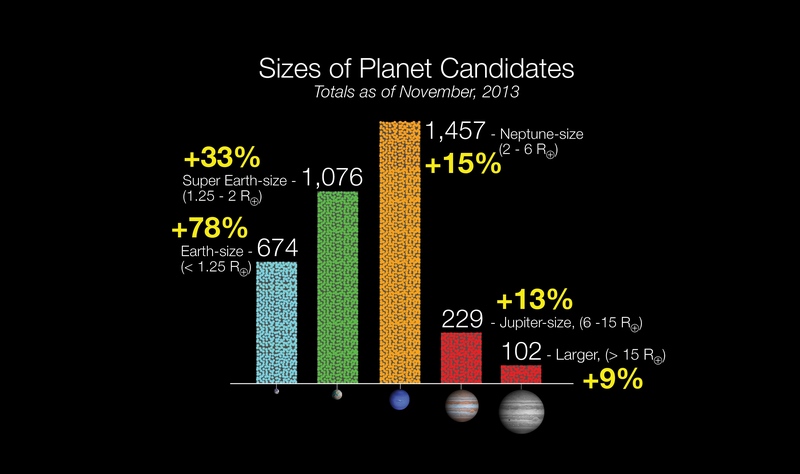 The current number of planetary candidates found by Kepler now totals 3,538. Another 156 planets have been confirmed by Kepler so far, with the vast majority of the rest expected to be confirmed as well. 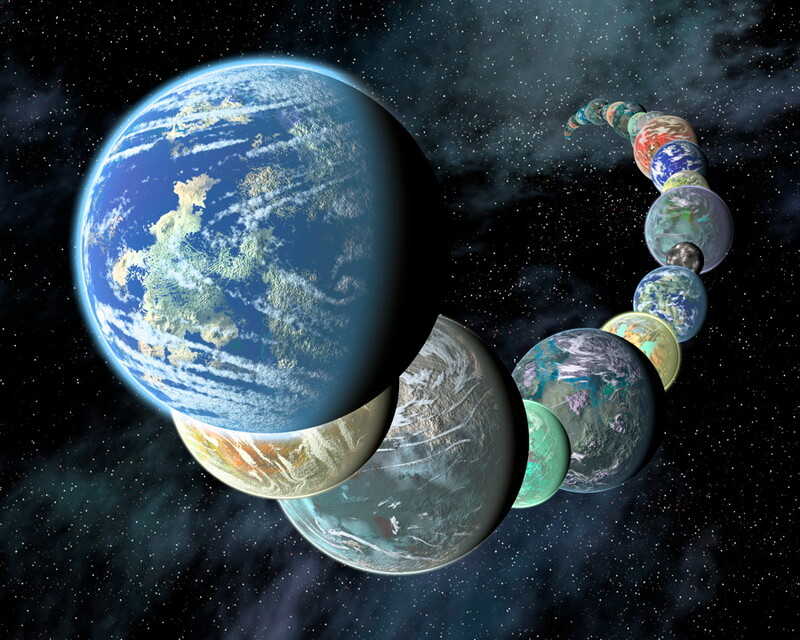 Apart from Kepler, an additional 1,038 exoplanets have been confirmed so far. Since the last Kepler update last January, the greatest number of new planets discovered have been Earth-sized planets, with an increase of 78%. This supports previous findings that smaller planets are much more common than larger gas or ice giants. It should be noted that Kepler has only focused on one small patch in the Milky Way, covering about 1/400th of the galaxy. It also can only detect planets which orbit their stars in such a way that their transits in front of their stars can be seen from Earth. The new estimates are extrapolated from that, to take into account the rest of the galaxy not covered by Kepler as well as the planets not seen by Kepler due to them not transiting their stars from our vantage point. Other techniques, and other telescopes, have been able to find many of these other planets as well however. Planets are also now thought to be common around red dwarf stars, the most common type of stars in the galaxy. How many of those ones might also be potentially habitable, in addition to the Kepler ones orbiting sun-like stars? The mind reels. See also this press release from UC Berkeley.